Sensors in autonomous vehicles have to be extremely reliable, since in the future motorists will no longer constantly monitor traffic while underway. In the past these sensors were subjected to arduous road tests. The new ATRIUM testing device from Fraunhofer Institute for High Frequency Physics and Radar Techniques FHR now makes it possible to move a large portion of these road tests to the laboratory. ATRIUM puts on a show for the vehicle's radar sensor, generating artificial scenery that comes very close to the actual conditions encountered in street traffic. The car of tomorrow will drive itself. Passengers will move down the road as if being driven by a private chauffeur while enjoying conversation, reading a newspaper or perhaps watching a video. Although driver assistance systems such as automatic distance control are no longer new to the market, it will still be several years before completely autonomous cars take to the streets. This is because the technology involved has to be absolutely reliable. The sensors are the deciding factor here: For example, today's radar sensors are already capable of independently detecting obstacles and applying the brakes in case of danger. These and other sensors are rigorously tested before being installed in the car. And autonomous vehicles require an even higher level of reliability, since if the driver is no longer at the wheel, the vehicle manufacturer may well be ultimately responsible for avoiding an accident. That is why automobile manufacturers have relatively high demands when it comes to sensor reliability. They demand sensors that cause no more than a single error over driving distances of several million kilometers, which means that today's cars often have to complete very long road tests. "That's a lot of kilometers," says Dr.-Ing. Thomas Dallmann, Leader Research Group Aachen at the Fraunhofer Institute for High Frequency Physics and Radar Techniques FHR. "On top of that, multiple sensors have to be tested in order to statistically prove their reliability. This means several test vehicles with sensors have to spend quite a long time on the road." Another difficulty: If an error occurs after several thousand kilometers, the sensor has to be optimized and the road tests have to begin all over again, an extremely time-consuming process. This principle has already been simulated in the laboratory using what are referred to as radar target simulators. These simulators collect the radar waves emitted by the vehicle radar and modify the radar signal to behave as if it had encountered objects. The simulator then returns the information to the car in the form of an artificial echo image. 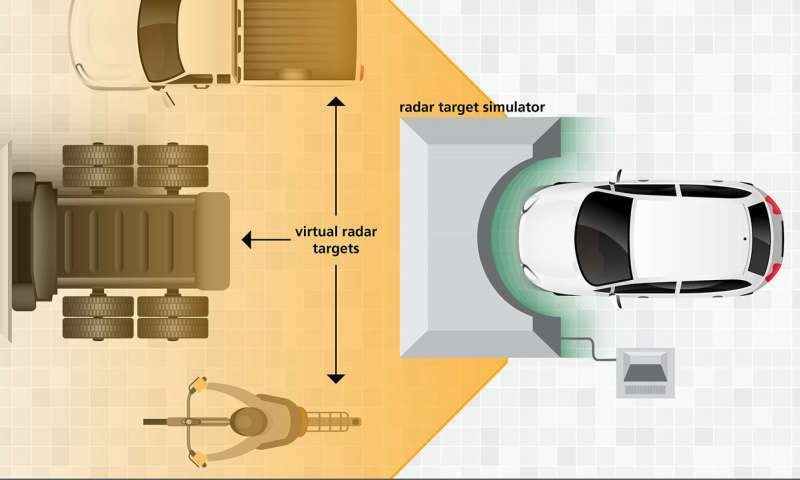 Thus the radar target simulator generates a simulated landscape for the vehicle's radar. The advantage is obvious: The test rig with a car radar and radar target simulator can run in the laboratory day and night, without having to put a car onto the street. Unfortunately, the few radar target simulators available on the market today are nowhere close to being able to generate a complete echo landscape. "Most of the models can only generate a highly restricted image with a single-digit number of reflections returned to the car's radar," says Dallmann. "That's an extremely small number compared to the situation in a natural environment." After all, real scenery contains hundreds of reflecting objects: people, cars, trees, traffic signals. Even a single vehicle in traffic can generate various reflections from different angles, for example a passenger car whose bumpers, wheels and side-view mirrors reflect differently. "We're still very far removed from a realistic setting when it comes to testing sensors for autonomous driving," the engineer continues. 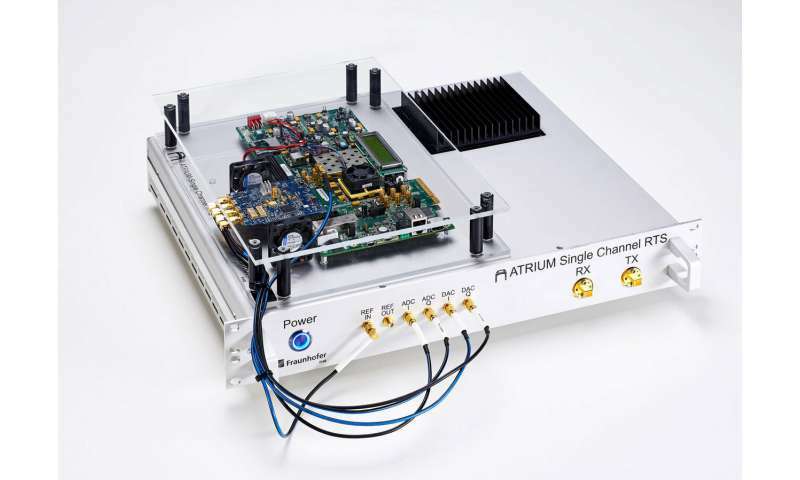 That is why Dallmann and his team are developing a new, higher-performance radar target simulator called ATRIUM (the German acronym for "Automotive test environment for radar in-the-loop testing and measurements"), capable of generating significantly more reflecting objects. The current goal of the Fraunhofer FHR is to be able to generate 300 reflections by the time the project ends, a tremendous objective. "This will mean that ATRIUM can present the car's radar sensor with a relatively true-to-life scene, something like a drive-in movie for the radar sensor." reduce the time involved in road tests." Dallmann and his colleagues will present the laboratory test facility with vehicle radar and the ATRIUM radar target simulator at the Automotive Testing Expo in Stuttgart from May 21 to 23.